'Forever Five O'Clock' Large Luxury Seacrest West Vacation Rental House with PRIVATE POOL! Snack at the bar after swimming in the private pool 30A Seacrest Beach 106 A Street Huge Private Pool and Close to the Beach Have a feast for any gathering with this spacious dining room Relax in this open space living room with a large flat screen TV Welcome to Forever Five O`Clock Your Personal Oasis 2 Dining Tables for ample dining guests Fully stocked kitchen with 2 of all appliances Second floor Family Suite with private bathroom This family suite also features a twin over twin bunk for the kiddos Tub/Shower Combo with double sink vanity in Family Suite Bathroom 3rd Floor Media Room with Wet Bar and HUGE flat screen TV Second king Guestroom with access to the balcony and a private bathroom. 2nd Floor Master Bathroom with double sink vanity Back Balcony overlooking the pool on second floor Gulf Views from one of the many balconies. First Floor Queen Bedroom with Private Bathroom Master Suite with access to balcony overlooking pool Second Floor Master Suite with Private Bathroom Enjoy your meals outdoors next to the private pool. More Gulf Views from the `Forever Five O`Clock` balcony Large Bunk Room on third floor with full bathroom 30A Aerial view of 106 A Street in Seacrest Beach Bunk room bathroom with double vanity. Welcome to Forever Five O`Clock Your Personal Oasis The peaceful surroundings of Forever Five O`Clock make for an awesome vacation The Sunset view from these loungers is unbeatable. 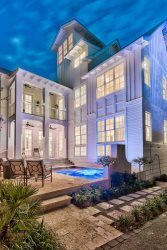 30A Escapes presents... "Forever Five O'Clock"
This gorgeous 5 bedroom, 5 full bath, 2 half bath home is a short 2.5-minute walk to the shimmering waters of the Gulf of Mexico. The home has peekaboo views of the Gulf on the 2nd floor front and rear balconies and expansive views of the Gulf from the 3rd floor front balcony. The 1st floor of this home has an open floor plan featuring a large kitchen with a 5-burner gas range, double oven, two full size refrigerators with ice makers, two dishwashers, built-in microwave, separate ice maker in pantry as well as a prep sink with disposal. Two large dining tables, plus a 4-seat breakfast bar make entertaining large groups a breeze. The comfy living area boasts a large flat screen TV over the fireplace and plenty of seating. This floor has one queen bedroom with a TV and a full bath with a large tub and shower and also a half bath for guests. An elevator (wheelchair accessible) is a great added feature for those tired legs after a fun filled day on the sugar sands of the Emerald Coast. The 2nd floor has 3 king masters all with private bathrooms ,TVs and balcony access. One of the bathrooms has a roll in shower while another one of the master suites has built-in twin bunks for “a family suite”. A family sized washer and dryer are located on the 2nd floor as well. The 3rd floor has a large media and game area with a half bath and a queen-sized sleeper sofa. The bar area, with a sink with a disposal, wine cooler, beverage refrigerator, and microwave is perfect for entertaining. There is also a large flat screen TV and PS4 game console in the media room which opens to another large porch with additional seating and views of the Gulf. Also, on this floor is the bunk room, which sleeps 8 and has a full bath. Poolside grilling awaits the grill masters of the group with a large natural gas outdoor grill. The large, lighted pool with magnificent water features can be heated according to your needs. Not your typical splash pool, the fountains make for great fun during the day and at night. A HUGE pool deck provides plenty of space for sunning or for having a nice dinner outside with family and friends. Additionally, the back yard is fully fenced and there is off street parking for 5 cars. And yes, each full bath comes with a hair dryer. 1)We do not offer Travel Protection Insurance in our quotes. You may obtain a Travel Protection plan through VRBO. Ask for more details should you wish to have a Travel Insurance Plan. 2) VERY IMPORTANT - WE DO NOT ACCEPT WIRE TRANSFERS. If you are ever asked to wire money for a vacation rental you are probably being scammed. We only collect payment by phone using a credit or debit card. Be very careful if you are ever asked to wire money. We accept Visa, MasterCard and AMEX only. 3) If you rent for a wedding or wedding function, there is a non-refundable $500 event fee. Our family had an amazing week at the beach. 30a Escapes was awesome in setting it up and any issues (all very minor)that we had during stay. Easy to contact, very timely and friendly responses, ease at checkout. Highly recommend. What a great week of amazing memOreos! Thank you Tara and 30A. This is the perfect house for big groups - there is tons of space to gather; everyone can eat together, but there's also so much space for folks to spread out. There's something for kiddos with the upstairs space, and the elevator for folks who need assistance! With the pool just out back, and the beach down the street, you cannot beat this house!